Correction: This article has been updated to correct a reference to Jaelyn Delshaun Young's background. We regret the error. Most people can tell you who the potential jihadists are, especially the ones in Europe and the USA. You can point them out in a group: they are immigrants, or more often, the children of immigrants, who came from the Middle East or North Africa. They often converse among one another in Arabic. Many want to join the Islamic State and other terror groups in Syria, or have gone and since returned. They are mostly men, usually around age 20 or less, and have grown up feeling alienated from the societies in which they live. The number of women among them is notable: according to the BBC, unlike the men, the "vast majority" of women who join ISIS from the West are converts. 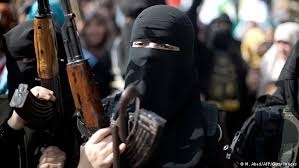 Similarly, according to the Dutch report, of the Dutch converts who have joined the Islamic state, 61 percent were women – a figure that seems consistent with other countries, as well. Among the more well-known: Jaelyn Delshaun Young, then a Mississippi State University chemistry student, apprehended en route to the Islamic State in 2015; Fatima Az Zahra, neé Maria Giulia Sergio, an Italian Roman Catholic convert whom the Italian media now calls "Lady Jihad"; and British ex-punk-rocker Sally Jones, whom counter-terrorists consider an active, effective, and therefore dangerous recruiter. To read more about social media and recruiting women, click here.